The What: LG Electronics USA Business Solutions unveiled the LG OLED “Wallpaper” Hotel TV, at the 2017 Hospitality Industry Technology Exposition & Conference (HITEC). The What Else: At just 3.86mm (0.15 inches) thin, the 65EV960H can be easily installed in luxury hotel suites using ultra-slim mounting brackets with a magnetic mat. Its electrical components are housed in the device’s Media Box, connected through an ultra-thin flat cable, which allows the panel to lie flush against the wall. 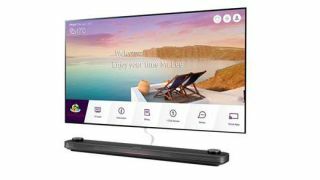 The LG OLED Wallpaper Hotel TV comes equipped with the Pro:Idiom digital rights management system and the LG Pro:Centric Smart applications platform, which improves navigation of LG’s content options within the interactive platforms. The display also supports leading high dynamic range (HDR) formats, including HDR10, Dolby Vision, and HLG. The TV’s 4K upscaler enhances the details and colors of non-4K content on the screen’s 8 million-plus pixels. The 65EV960H reportedly also incorporates Dolby Atmos sound, allowing viewers to hear surround sound with overhead audio. The Bottom Line: The 65-inch class OLED Wallpaper Hotel TV (model 65EV960H) combines LG’s hotel TV technology with the sleek aesthetic of the LG SIGNATURE OLED TV W, now available on the consumer market. The Wallpaper Hotel TV joins 55- and 65-inch class LG OLED hotel TVs for a premium in-room guest experience. In addition, a host of LG OLED commercial displays are now available for hotel public spaces. They include Dual-View Curved Tiling, Dual-View Flat, Video Wall, Open Frame, Wallpaper Digital Signage, and In-Glass Wallpaper LG OLED displays.